This contemporary bonded leather stationary sofa and loveseat will be a gorgeous addition to your living room. The plush modern tufted look back cushions, and deep seat cushions make this group comfortable and cozy. Sleek track arms and square tapered feet finish the look. The sophisticated bonded leather is over a solid hardwood frame, webbed back, and sinuous spring base for support and long lasting comfort. This living room set will blend beautifully with your contemporary living room decor. 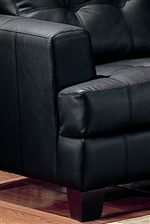 The Samuel 2 Piece Black Bonded Leather Loveseat and Sofa Group by Coaster at Furniture Discount Warehouse TM in the Crystal Lake, Cary, Algonquin area. Product availability may vary. Contact us for the most current availability on this product. The Samuel collection is a great option if you are looking for Contemporary furniture in the Crystal Lake, Cary, Algonquin area. Browse other items in the Samuel collection from Furniture Discount Warehouse TM in the Crystal Lake, Cary, Algonquin area.